MIDI is like air, it's all around you, most of the time you can take it for granted, but if you are a digital musician you probably couldn't live with out it. MIDI is inside musical instruments, computers, tablets, smart phones, stage lighting, audio mixers, and many other products from well-known international companies including Apple, Gibson, Google, Korg, Microsoft, Roland, Yamaha, and hundreds more. By the fall of 2015, it's projected that they will be around 2.6 billion devices on the planet that are MIDI enabled! MIDI is almost always an integral part of the modern recording process for popular music and the music that is made for films, TV, and even video games. MIDI-equipped electronic keyboards are connected to computers and mobile devices running Digital Audio workstation software that record both MIDI and Audio to produce music. With advances in computing power making digital software based instruments sound ever more realistic, the music you hear on TV, in radio ads and in movies is often recordings of MIDI instruments (both hardware instruments and virtual "soft synth" software rather than of dozens of acoustic instruments. Even the huge orchestral score playing behind that big-screen block buster almost always starts off as a MIDI mockup arrangement and then the composer uses MIDI to transcribe the parts into music notation. More and more DJ gear has MIDI integrated into it and the last few years has seen a dramatic rise in the number of unique DJ MIDI controllers and controllerists- artists like Moldover that use MIDI to manipulate sound and loops via MIDI controllers. 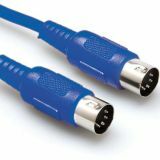 MIDI technology has been around for more than 30 years, and first appeared in the form of a special 5-Pin DIN connector on the back of a keyboard that is used to connect to another keyboard or to a computer. Though 5-pin DIN connections are still used for making connections between standalone hardware digital instruments, over the years as computer technology had developed and advanced so has MIDI. MIDI support to existing apps and creating new apps that are Web-MIDI enabled. If you own an iPad or iPhone you probably know that there are hundreds of programs you can get for making music (even on-the-go) that use Apple's CoreMIDI technology to connect to MIDI devices.CoreMIDI also allows an iPad/iPhone to send/receive MIDI messages via Wi-Fi allowing the iPad/iPhone to control and/or play sounds and sequences on the Mac, and vice-versa.CoreMIDI also supports MIDI connections via USB, Ethernet, and FireWire (where equipped). Windows users can also connect to Macs and iOS devices via a third party RTP-MIDI. With Android M, Google has added robust MIDI support for the billions of Android devices that are available making MIDI one of the most ubiquitous technologies on the planet. Of course, MIDI is not just for keyboards... other MIDI-equipped musical instruments include digital drums, guitars, wind instruments, and more. For electronic dance music (EDM) and DJs, there are specialized controllers that use MIDI to trigger beats and loops, and to control lighting. And new kinds of digital musical instruments and controllers are being invented all the time, all of which integrate perfectly with existing instruments and devices because of MIDI. Besides music creation, MIDI has some other interesting and popular uses. MIDI Show Control is a set of MIDI messages used for controlling lights and rides at theme parks as well as for operating themed events such as are found outside many Las Vegas casinos. And MIDI Machine Control provides remote transport control for many kinds of audio/video recording devices. Moreover, because MIDI is widely available and free to use, many people are able to develop unique DYI products using MIDI to control and/or generate sound... in all kinds of shapes and forms. If you'd like to learn more about the amazingly diverse world of MIDI, this is the place as the site has videos, tutorials, forums and stories about MIDI artists.So join the community of people who make music and art with MIDI and learn how to get the most out of this incredibly flexible technology.